Pensacola, FL (AHN) – Florida’s Board of Governors unanimously approved a University of Florida tuition increase of $1,000 per year in a vote Thursday. The additional fee, which is intended to be used to hire more teachers and advisers, must be approved by the Legislature by May. The university’s Board of Trustees will then vote to make it official. But here’s the catch; several news stories have made the statement that this fee increase will not be covered by either Florida’s Bright Futures scholarships (75% of florida resident students typically qualify), nor by the guaranteed Florida pre-paid college tuition plan. I’ve scoured news accounts on the web, and I cannot find a good attribution for this statement. I don’t know if it is a condition imposed by the University of Florida, or if it is a declaration of policy by other Florida officials. Linda and I bought in to that pre-paid plan for 100% coverage back when Gina was born, and its somewhat unlikely Gina would actually attend UF Gainesville. But if this develops as it is being reported, it could be grounds for some serious litigation or class action, and I would want to get involved. 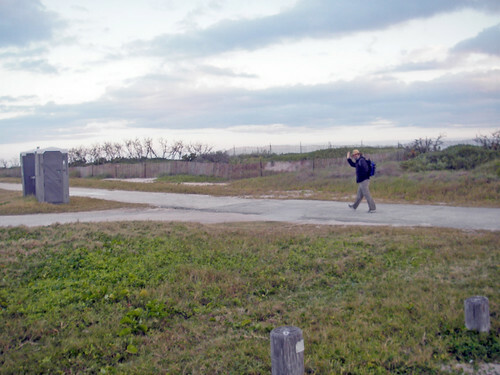 It is a tenuous precedent for Florida higher education. I’ll be watching the legislature’s action on this proposal closely when they convene next May. Last weekend Linda and I volunteered to help with the local regatta, the big race hosted by WPHS. Heavy winds curtailed the racing. Several boats swamped and some kids had to be rescued. Complete photo set available on flickr. You can also go directly to the photo set with captions and get larger copies of the photos here. 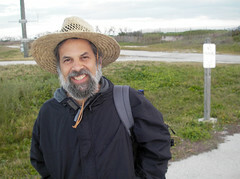 Harold invited me to join him on a beach walk friday on the Canaveral National Sea Shore. Its a long desolate stretch that bridges two counties out by the space center. We walked this together back in the late 80’s and again in the 90’s. I had to decline because of a caroling gig friday afternoon, but I was happy to drop him off early in the morning and then go fishing myself. If Harold’s willing, we may do this again after the new year. 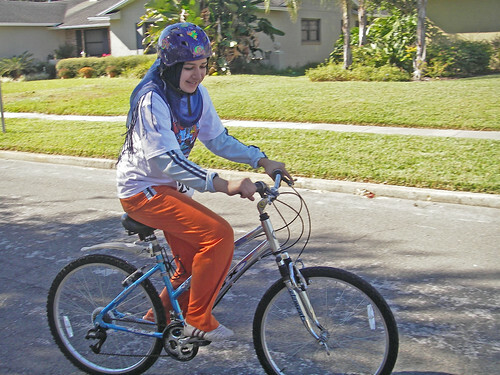 After the turkey trot, we helped Hiba with a bike lesson. 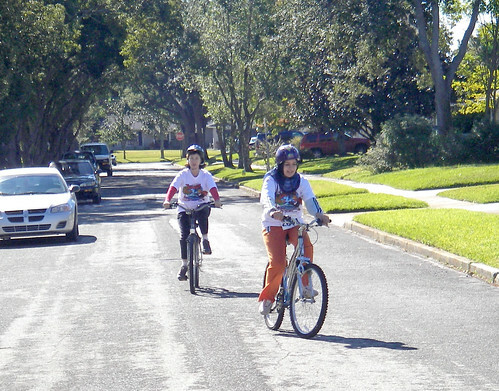 After a few false starts, she wobbled in short stretches, then made it all the way around the block. I did it again, and this time I had family company. 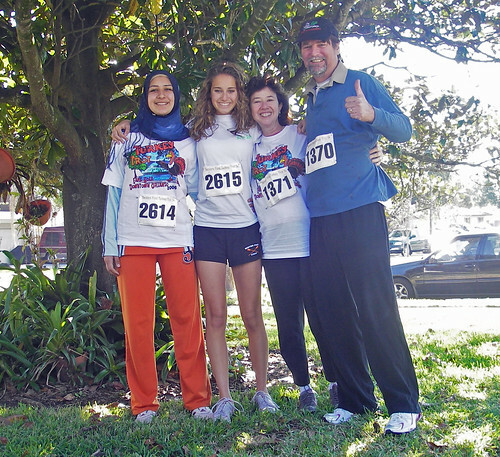 Gina ran the holiday 5K along with one of her crew friends, Linda and Hiba walked it. I ran it and met Seth prior to the finish line (he’d already finished in competitive time). Seth crossed the finish line with me, and helped to round up our party. We celebrated with a breakfast at IHOP. The weather was crisp and beautiful. Heralded Winter Park girls head to Lake Monroe. With 26 state championships since 1971, the Winter Park High School crew team has reached a pinnacle matched by only a handful of high-school sports programs. Nice article in the NYT about a wedding video company that eschew’s video and shoots exclusively on celluloid, from super8 to 35mm. They hire film school grads and have a somewhat lofty clientele. The Times has some nice media excerpts on their site and it appears to me that the celluloid angle is not such a big deal; its the technique they use, from shooting angles and camera movement, to editing and music. The end result is kind of independent-film looking, and could be accomplished with video technology just as easily. But the cachet of ‘filmmaking’ is undoubtedly what sells. Here’s a full length sample of their product I found on youtube. This is part 1 of 3.